I woke up this morning feeling really upbeat about the week ahead, because today is the start of our ninth annual Get Online Week and there’s lots of exciting things happening all across the country. I love visiting our network of community partners and the best thing about Get Online Week is that it gives me the perfect excuse to spend an entire week out of the office meeting centre staff, volunteers, and learners. One event that I’m particularly looking forward to is Wednesday’s trip to Exeter Library. I am a big fan of libraries (my colleagues here at Tinder Foundation can vouch for that) and I firmly believe that they play a very important role in communities across the UK. In order to support libraries to deliver digital inclusion activity, we recently launched a new project called the Libraries Digital Inclusion Fund, where we awarded funding to sixteen libraries to deliver innovative activities with the aim of reducing digital exclusion in their communities. The project is giving us a great opportunity to work with libraries and I believe it will do a fantastic job raising awareness of the great work that they do. 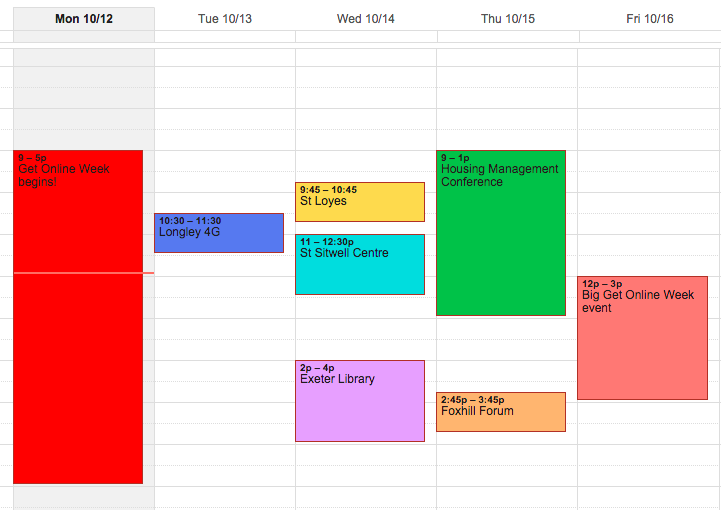 For me and my team, Get Online Week is the perfect excuse to go out and visit a library. I am certainly looking forward to mine, as I’ll be meeting up with Ciara Eastell the President of the Society of Chief Librarians and the Head of Libraries, Culture & Heritage for Devon County Council. You can be rest assured that I will be discussing all the great work being done in libraries, across the UK online centres network and beyond. As usual one of the biggest parts of our campaign is social media. Anything you do this week that’s even slightly Get Online Week-related, I want to see it on Twitter, Facebook, LinkedIn, or whichever channel it is that you use. Post it with the hashtag #GOLW15 and we’re guaranteed to see it. 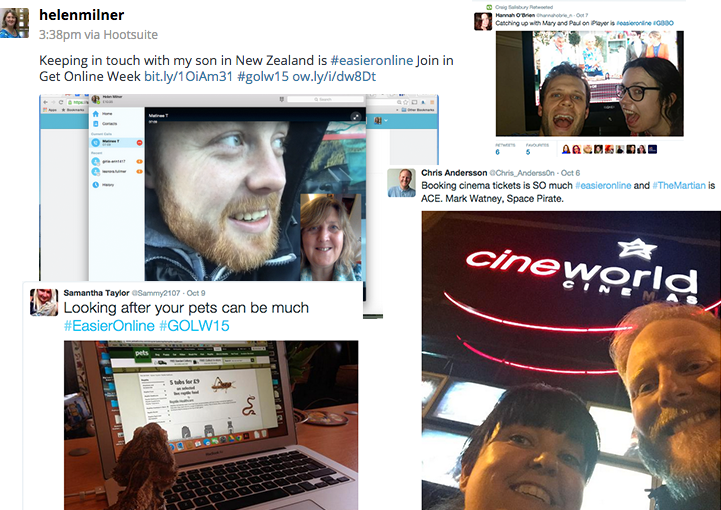 Last week I posted my #EasierOnline photo too. I’m sure you managed to see it, but if not I’ve posted it here below, along with a couple of others from my team. As part of the campaign we’re asking everyone to get involved and post a picture on social media of something that’s much easier online. Whether that’s booking your cinema ticket, buying pet food, catching up on TV shows or chatting with family abroad; if it’s easier online, post it with the hashtag for the whole world to see. I’ll be blogging about my visits to fill you in on my experiences. I’ll let you know where I’ve been, what I’ve seen, who I’ve met, and my thoughts on the campaign so far. I’m off to Longley 4G here in Sheffield tomorrow, and I cannot wait. Until then…Happy Get Online Week!